There are only a few things I know about the world. Sunrise in the east, sunset in the west. Death and taxes. Cheese is definitely ok to toss on to your baby in a high chair, but probably not ok to toss on somebody else’s baby. TL:DR – You need to consider the patient when you get an ECG, and you need to look for a few specific things on an ECG ordered for syncope. Have a plan, or a mnemonic. #cheesechallenge. Your patient came to the ED after passing out. Now what do you do? You could do a lot, including cbc for anemia, chemistry for electrolyte abnormalities, BNP for cardiogenic cause, head CT for SAH, CT PA for PE, MRI for TIA/CVA, CTA for dissection or ruptured AAA, and probably some others. We won’t go through a whole syncope algorithm tonight, but you can certainly find many out there, including some clinical decision guidelines1,2,3. Tonight, suffice to say that everybody should get a POC glucose, POC pregnancy (women only please), and an ECG, the star of tonight’s post. Over the last month or so of overnights, I’ve been focusing on the ECG reading in Syncope. Probably shouldn’t ever present a case of syncope without an ECG. Definitely shouldn’t ever present a case without reading the ECG that’s already done. You should read the ECG – i.e. however you usually read ECGs (rate, rhythm, axis, etc.) you should start there. You should read the ECG looking for ECG abnormalities that might explain the syncope. intervals (which is nice because it is near the end of my regular ECG routine). In particular, short PR phenomena like WPW or LGL. Which can devolve into VF/VT from aberrant conduction. Long QT (short QT too) – over 500 QTc is interesting, over 525 might be concerning. Which can lead to TdP. High degree blocks – 2° type 2, and 3°. Can lead to pauses that lead to syncope, which requires pacer placement. BTW, you should have already diagnosed this because you already read it already, in step 1 above. Bundle blocks can lead to paroxysmal AV block as the cause. 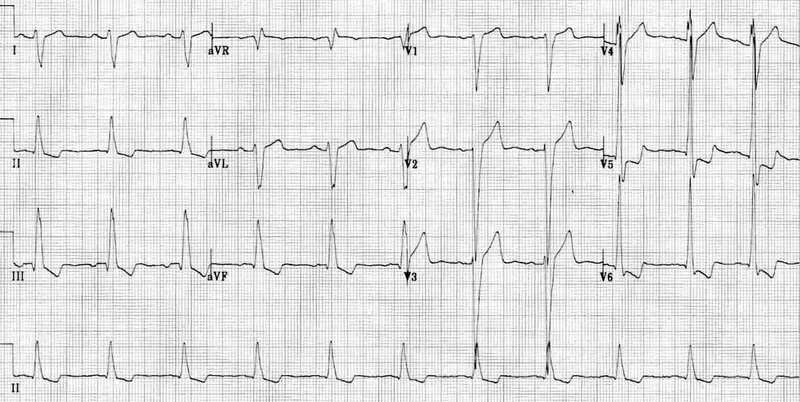 Brugada – Sodium channel mutation. Linked with sudden cardiac death. ‘Coved’ (I call it “shark fin”) ST into inverted T or ‘saddleback’ ST in early precordial leads. ARVD – Arrhythmogenic Right Ventricular Dysplasia (or ARVC – cardiomyopathy) – fibrofatty deposits, leads to VT/VF arrests, young healthy sudden deaths often during exercise/stress/illness. The Epsilon wave is often hard to see (tucked in to the end of QRS), but if you have the right patient, and you think it might be there, consider zooming in. That is double the rate and amplitude of the ECG machine. 50mm/s and 20mm/mV. Or take a pic with your phone and zoom in with your fingers you crazy millennial. LVH which may be related to Aortic Stenosis, or HOCM. Dilated Cardiomyopathy – often with critically low EF (can’t see this on ECG). Right heart strain – PE, Pulmonary hypertension, etc. In cases where the STE is more subtle, you can consider getting a right sided ECG. Where at least v4R (or complete right sided leads) should be taken on the right side. These are probably not nitroglycerin candidates for their STEMI. 2 more mnemonics, ABCDE-I and “I get my Dairy Queen At HEB” which you can look up. But, these mostly cover the same stuff. If the ECG has any of these things, it’s much harder to fall back on vasovagal or orthostatic as your diagnosis. Guidelines for the Diagnosis and Management of Syncope (version 2009): the Task Force for the Diagnosis and Management of Syncope of the European Society of Cardiology (esc). Oxford University Press, n.d.. Internet resource. Tintinalli, Judith E, J S. Stapczynski, O J. Ma, David Cline, Garth D. Meckler, and Donald M. Yealy. Tintinalli’s Emergency Medicine: A Comprehensive Study Guide. , 2016. Internet resource. All ECG citations are in the captions and most have discussions that you may find helpful.